As well as aesthetic and performance requirements, the need for more sustainable envelopes is influencing architects’ choice of materials when it comes to facades, says Simon Wild of Formica Group. Architecture has been described as “a visual art where buildings speak for themselves”. In practice, however, it is not always possible for architects to pursue their aesthetic vision without compromise. The requirement for projects to be functional often means that the initial design concept has to be modified. Balancing factors such as building infra- structure and environmental considerations, including stricter energy regulations and budget limitations, can be a challenge. Today’s facade options are making it easier for architects to create buildings that balance the functional and cost require- ments of the client’s brief with aesthetic choices, to deliver ‘statement’ design. Some of this expanded choice of envelopes made available to architects is being facilitated by manufacturers. For example, manufacturers are now using the benefits of High Pressure Laminate (HPL), once predominantly speci- fied for interiors, and bringing the benefits of the material’s properties to rainscreen cladding solutions. Traditionally, HPL has been specified for interiors due to its durable, hygienic and easy to maintain properties that make it ideal for the requirements of the built envi- ronment. Equally significant to its popularity is the broad selection of decora- tive options the surface permits. Considering both aesthetic and functional demands, it is understandable that architects are taking advantage of the bene- fits afforded by materials such as HPL and increasingly applying the material to build- ing envelopes. 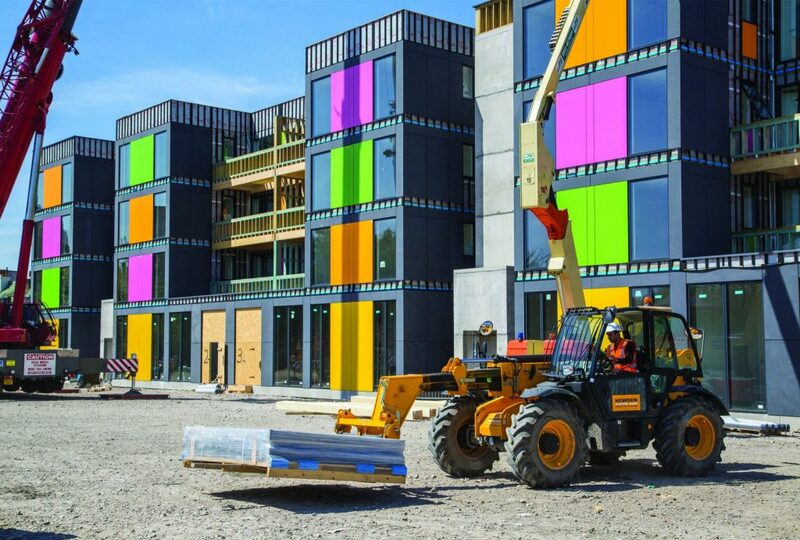 Take for example the internationally-renowned Rogers Stirk Harbour + Partners (RSHP), the architects behind Lewisham Pop-Up Village, who selected HPL rainscreen cladding as part of a practical solution to housing homeless families currently living in B&Bs. 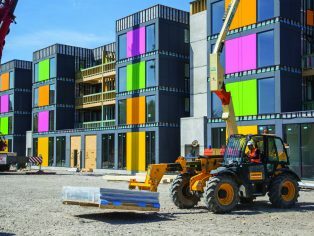 With the Government wanting to build a million new homes by 2020, and having built just under 293,000 homes in February, council projects like Lewisham Pop-Up Village play a supporting role in alleviating the housing crisis. In its design approach, RSHP took steps to meet the social responsibility of the 24-home Pop-Up Village without compromising on looks. The vibrant coloured rainscreen cladding and striking red stairwells are the first aspect of the ‘village’ likely to be noticed by passers-by and inhabitants. RSHP specified VIVIX panels by Formica Group because of their substantial choice of colour that made it possible to inject the sense of visual vital- ity and a welcoming feeling that was integral to the design. Beyond the facades, the material properties of the rainscreen cladding specified also supported the build- ing’s overall sustainability credentials. RSHP wanted to achieve a ‘future proof’ design with long term value. The rainscreen cladding, the panels were manufactured in Europe according to the ISO 9001 standard which under the building’s Life Cycle Assessment confirms they were manufactured with minimal impact on the environment. Within environmental considerations a lightweight material such as laminate is beneficial in contributing to a lower carbon footprint, particularly with regards to trans- portation. Lightweight panels also offer ease of application, including some having the option to be placed over existing surfaces, which in turn assists in meeting construction deadlines and budget require- ments. In addition, future building work can be undertaken with minimal disruption to inhabitants. 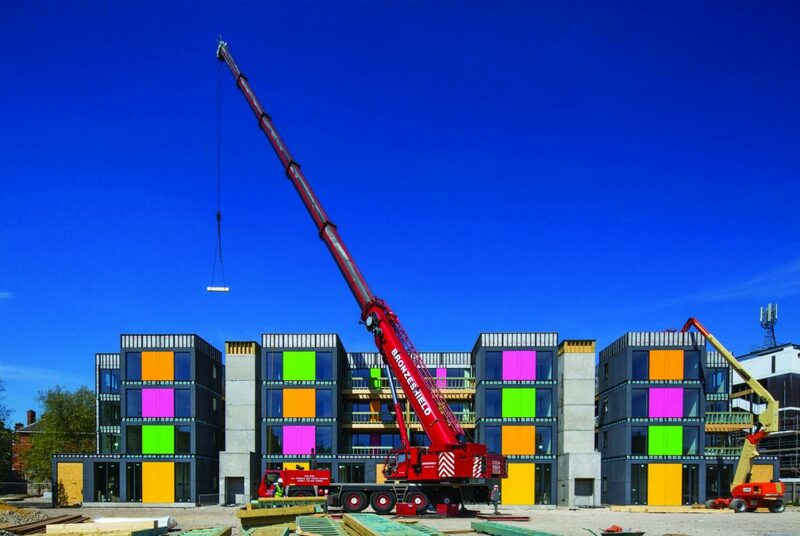 Steps were taken to significantly diminish the waste produced on the Lewisham site, for instance the facade panels were pre-cut offsite to ensure a sustainable installation process. In addition, since the panels were manufactured in Britain, the transportation distance and overall carbon footprint of the project were also reduced. The Pop-Up Village is designed to have a lifespan of 60 years. In order to provide ‘portability’ to facilitate reconfiguration to other areas of vacant land, the specification of sustainable and durable material is essential to the project. Lightweight facades make their future reconfiguring and reuse elsewhere easier to handle. In its design, development and execution, Lewisham Pop-Up Village is an example of how architects can specify sustainable building products that complement energy efficiencies without sacrificing aesthetic vision. This is partly thanks to the technology being used by manufacturers to create solutions with extensive colour and texture choices based on an understanding of the factors important to architects. In the case of Lewisham Pop-Up Village, the bright pink and orange panel colours were achieved using a digital and print service. Similarly, modern technology facili- tates the specification of panels with the look of natural surfaces, for example wood, metal and stone, but in material with better durable, hygienic and cost efficient proper- ties. From an architect’s perspective, the prospect of more design choices means that they are one step closer to achieving a building that visually speaks for itself.